Columbia Road Market is a flower market run by individual stall holders in Columbia Road in East London. 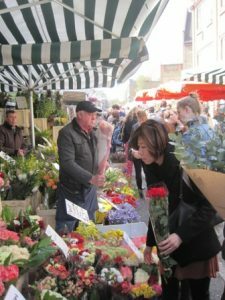 The market operates from 8:00am to 3:00pm every Sunday. Bargains can be had, especially toward the end of the day. On sale are plants of every description, garden accessories and various artisan products. Shops along the street sell unusual products and are open all week. The air is perfumed with plants and flowers and the atmosphere is friendly and jovial. You are likely to come across some unlikely three piece bands on the pavement which usually feature a double bass.